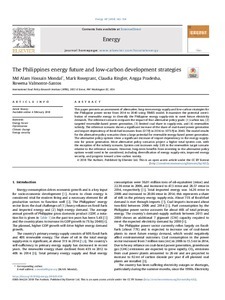 This paper presents an assessment of alternative, long-term energy supply and low-carbon strategies for the Philippine power sector from 2014 to 2040 using TIMES model. It examines the potential contribution of renewable energy to diversify the Philippine energy supply-mix to meet future electricity demands. The reference scenario compares the impact of four alternative policy goals: (1) carbon tax, (2) targeted renewable-based power generation, (3) limited coal share in supply-mix, and (4) renewables subsidy. The reference scenario shows a significant increase of the share of coal-based power generation and import dependency of fossil-fuel increases from 227 PJ in 2016 to 1073 PJ in 2040. The model results for the alternative policy scenarios show a large potential for renewable energy-based power generation. The alternative policy options show a significant decrease of import dependency in the energy supply-mix for power generation. Most alternative policy scenarios project a higher total system cost, with the exception of the subsidy scenario. System cost increases only 2.6% in the renewables target scenario relative to the reference scenario. However, long-term benefits from investing in the alternative policy options would need to be considered, including diversification of energy supply-mix, improved energy security, and progress toward a low-carbon society.